Kevin Wheeler snips the ribbon during a celebration of his ownership of Frank-Wheeler Chiropractic in Wauseon. Wheeler and his wife Sarah (holding Cecilia, 18 months), center left, offer chiropractic services, therapies, dry needling acupuncture, massage therapy, and rehabilitation exercises. Their practice, located at 601 Meadow Lane, is open Monday-Thursday, 8 a.m.-7 p.m.; Friday, 8 a.m.-noon; and Saturday, 9 a.m.-noon. Also pictured are the couple’s four-month-old son, Quinn, relatives, and members of the Wauseon Chamber of Commerce. 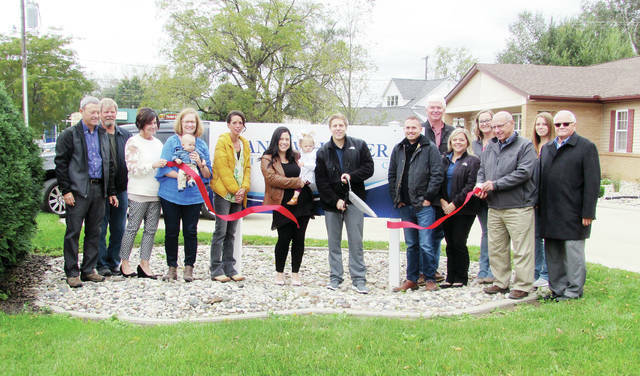 https://www.fcnews.org/wp-content/uploads/sites/45/2018/10/web1_frank-wheeler-chiropractic.jpgKevin Wheeler snips the ribbon during a celebration of his ownership of Frank-Wheeler Chiropractic in Wauseon. Wheeler and his wife Sarah (holding Cecilia, 18 months), center left, offer chiropractic services, therapies, dry needling acupuncture, massage therapy, and rehabilitation exercises. Their practice, located at 601 Meadow Lane, is open Monday-Thursday, 8 a.m.-7 p.m.; Friday, 8 a.m.-noon; and Saturday, 9 a.m.-noon. Also pictured are the couple’s four-month-old son, Quinn, relatives, and members of the Wauseon Chamber of Commerce.